The Operations and Finance Committee approved funding designs for changes on Bass and Sardis Church roads. The committee agreed Tuesday to spend $228,000 on designs for widening Bass Road, extending from Riverside Drive to Zebulon Road. Also, another $111,000 resolution approved Tuesday is for design and engineering concepts for an extension of Sardis Church Road. Reichert said the design work along Bass Road may help persuade the state to cover the costs for the widening. Both resolutions will go before the full County Commission next week. Maps detailing plans for a so-called "western loop" stretched across the walls at Carter Elementary School on Thursday, showing residents what they could expect if the road widening and improvements go forward. Changes since the last public meeting nearly a year and a half ago have been minor, said Van Etheridge of Moreland Altobelli Associates, the private company chosen to manage the road improvement program for the county. Although there was no formal agenda, Etheridge and other representatives were on hand to answer questions about the concept, which was met with both disdain and delight. More than 70 people attended. Plans for the $80 million western loop include altering the design of Bass, Foster, Tucker, Heath and Fulton Mill roads from Riverside Drive to Eisenhower Parkway, about 10 1/2 miles. Bass Road would be widened from two lanes to four with a median, bike lanes and sidewalks from Riverside Drive to Zebulon Road. From there, the expansion shrinks, alternating between three and two lanes. Because of new traffic count projections for the year 2035, an additional left turn lane has been added in each direction at the intersection of Bass Road and Interstate 75, Etheridge said. Also, the new two-lane connector from Calvin Drive to Tucker and Peake roads has been scaled back from three to two lanes, he said. Several Bass Road residents said the proposed four-way divided highway is overbuilt and would ruin the quality of life for those who live there. "To me, they are stripping the neighborhood for just a highway," said Jackie Johnson. Kathy Bridges, who moved into a house on Bass Road in May, said she was concerned about not only the overbuilding of concrete but also her yard. She's slated to lose 62 feet, she said. "The turning lane will be my front yard," she said, noting that she just didn't see the congestion that would make a project like this necessary. But others who live farther down the road praised the project, saying that heavy traffic makes it hard to safely turn onto Tucker Road from the side streets. Bob Grier said it is about time the county started moving traffic more efficiently across town. As it is now, there's no easy way to get from his home off of Columbus Road to north Macon, and the two-lane roads leading up there often are bogged down with traffic, he said. "I think it's the greatest thing since sliced bread because Macon needs to move traffic," he said. "This is about the straightest route across town you can make." Several residents said they were disappointed there was no formal session allowing time for engineers to explain the concept and for residents to publicly voice their opinions. Suggestions from the last public meeting did not impact the current plan, and Bass Road resident Russ Slack said he felt their voices weren't being heard. "My feeling is that they're holding meetings, but they're really not listening," he said. They don't listen to residents. Same deal as Forest Hill and the Eisenhower Parkway Extension. GDOT is the worst state agency we've got, and that's saying something. TheHistorian, Forest Hill NEEDS a turn lane. Bass Road needs to be a divided highway? Not really. When I am stopping traffic on Forest Hill for five minutes because I need to make a left to get home after work, common sense would say that needs to be addressed. Every day when I am stuck trying to make a left, I see someone in a hurry behind me flailing there arms around, yelling, and looking like a fool. I'd bet some of those same folks have a "Save our Forest Hill Road" sign and some yellow ribbon in front of their house. The Bass Road Widening is long overdue! The Forest Hill money needs to be moved to Bass where the growth is. It is ridiculous that all the new construction was allowed without the infrastructure. I think the bike lanes and sidewalks will be nice additions. Why not connect I-475 to 75 south back toward Macon. It would be nice if there was an image or map of this plan on the website. I am lucky I am surrounded by houses on all 4 sides, I think we need the improvement, but there has to be better ways to accomodate everyone. I am sympathetic to most of the Bass Rd residents -- especially those who have lived there prior to the commercialization of the area. Everytime I drive down Bass Rd., I have major house and yard envy. The DOT was organized to take raw data and spit out roads. They were not organized to take citizen input into their calculations about the road. DOT people don't buy houses on thru roads, wonder why? I wonder who will pay to move those giant metal power poles along the route? "The DOT was organized to take raw data and spit out roads." Actually the data has been "cooked" by the consultant - Tom Moreland-Altobelli who looks in a crystal ball (their bank account) and then they tell the Ga DOT an estimate of how many cars will be using the road in 20 years. Wonder if they figured-in for $5/gallon gasoline? No. Nor did they figure for smaller/smarter cars, nor for more efficient intersections like roundabouts. Moreland wants a BIG Road so he can make Big$. Tom Moreland is a "fox consultant guarding the hen-house" Taxpayers and Citizens - WAKE-UP! About 150 people gathered Thursday night for a public hearing to look at project maps for the so-called "western loop" and offer comments to the engineers who drew up the plans. Hung like tapestries along the walls at Carter Elementary School on Zebulon Road, three 15-foot-long maps detailed exactly where changes are proposed to 10.5 miles of existing roads between Interstate 75 and Eisenhower Parkway. According to these documents, the current version of the western loop would add 10 new traffic lights, a bridge over Interstate 475 and alter the design of parts of Bass, Foster, Tucker, Heath and Fulton Mill roads - a move that is not popular with some residents. Bill Kent, who owns property along Bass Road, had his own proposal ready and was waiting just inside the cafeteria's doorway to share it with anyone interested in an alternative to the county's proposal. Those who studied the official plan saw that Bass Road would expand from a two-lane road to a four-lane road with a raised median between I-75 and Zebulon Road. At that point, the proposed expansion shrinks to three lanes at Foster, Tucker and Heath roads and then becomes two lanes from Fulton Mill Road to Eisenhower Parkway. Although the width of the individual roads will vary, all sections of the plan include curbs and gutters on both sides of the road, as well as sidewalks and bike paths. Robert Walker, a representative of Moreland Altobelli Associates, the private company chosen to manage the road improvement program for the county, said the varying road widths were determined by the projections that estimated traffic counts for the roads in 2025. In most cases, he said, they found "very aggressive growth along the corridor." Walker's testimony didn't impress the handful of audience members who overcame a microphone that continually crackled and occasionally quit in order to express themselves. Susan Hanberry Martin, chairwoman of the Macon Area Transportation Study's citizens advisory committee, said she was not satisfied the traffic counts on display were accurate. Echoing her committee's comments about the (unrelated) Forest Hill Road project, she suggested the engineers go back to the drawing board and come up with a new design that included roundabouts. "I hope we see a different process in this project," she said, referring to how she believes citizen input was ignored in other local road projects. "Let's do a road right for a change. We haven't done a road right in Bibb County yet." Other residents expressed concern about the proposed median blocking their driveways and questioned the amount of right of way the project would require. "We are still in the concept or developmental stage," said Joe Wood, who heads the road improvement program. Wood added that the project currently has no specific date set to start construction or begin the acquisition of rights of way. When asked about the current price tag for the project, Wood said he wasn't sure if the original $21 million amount was still accurate, given the fact that the costs associated with construction have skyrocketed in the wake of higher oil prices. "Costs have gone up all over the board," he said, explaining how other projects have seen their bottom line amount jump as much as 30 percent to 60 percent higher. "We don't have an updated cost on this project. It's too early in the process." Bibb County Commissioner Elmo Richardson, who attended the meeting, said he thinks the project is necessary because he drives the route every day and can see the growth for himself. 1- the word "unrelated" (in red below) is not correct. These projects are indeed related in the same way as two front tires on 2 different cars are related if those two car's tires were placed by the same mechanic in the same business using the same materials, tools and helpers. This is the case with the Western Loop, Forest Hill Road and with Moreland Altobelli Associates, Inc.
2- Bibb Commissioner, Elmo Richardson made money off of both these projects as a subcontractor (as VP of Stantec, and as a principal in Tribble and Richardson) for preliminary engineering on both of these projects. The Telegraph report should have disclosed this. We are hereby requesting that the Editors and Publisher of the Telegraph to please publish these clarifications in the paper. of material you're talking about. That story (promised above) never happened. Western Loop stakeholder's meeting on Thursday, March 27, 2003, from 6pm to 8pm, at the First Presbyterian Day School cafeteria, 5671 Calvin Drive. I will be trying to answer that question in an upcoming article. Hi Travis,Thanks for attending the Western Loop meeting last night. It got really "pointed" after you left and that's putting it nicely! I just wanted to mention that the question that was asked while you were there, and was asked at least 10 times during the meeting, "Who is responsible for the road's design of 5 lanes," was never answered! Bibb County is not blessed with very cooperative civil servants! The continuing controversy that haunts the Roads Program magnifies the division and lack of planning that exists in Macon and Bibb County. Public officials show a complete disregard for public opinion and often stonewall many good ideas under the pretense of "for the better good." Segments of the community promote issues that benefit themselves with little concern for the community as a whole. Road expansions are viewed one-road at-a-time instead of as a community road system. This brings to mind the I-16 and I-75 interchange. How can this interchange be designed without considering the Pierce Avenue and Riverside Drive exit; plans for the Hardeman and Forsyth exit; the South Downtown Connector, Eisenhower Parkway and its extension to I-16; Spring Street; Second Street; MLK; and the possibility of a rail system, all of which impact the traffic counts and flow. I beg to differ with local officials who indicate that the DOT design engineers are much wiser and more knowledgeable than the public who bears the responsibility of trying to maneuver these streets daily. If my memory serves me correctly, these wise DOT engineers created the original I-16 and I-75 interchange, the North I-75 and I-475 interchange and the South I-75 and I-475 interchange as well as several other boondoggles. I would suggest that a new "open-minded" DOT design team meet with a local delegation (officials and layman) to design a road system that compliments, rather than divides, our city. Dana Cross is a resident of Warner Robins. We wish you had been at the meeting tonight. It was awesome. The citizens rose up and essentially took over the meeting. They have insisted that a 2 lane option be considered for Bass Road. I can answer one of your questions. Moreland Altobelli has been paid slightly over $18 million since the roads program began. I am working on an article that will, in part, trace these payments. I attended the TAC [Technical Advisory Commitee] meeting of the Macon-Bibb RIP [Roads Improvement Program] on Thursday, April 17th. Mr. Steve Duval, who is the public relations person for Moreland-Altobelli [M-A], the managing company for the Macon-Bibb RIP, falsely reported to the committee that there was little opposition to the proposed five-laning of Bass Road. He misstated the verbalized opposition at the Bass Road Stakeholder's meeting held March 27th at Martha Bowman Church by saying that, "only 3-5 people opposed the presented plan of 4-5 lanes. He further stated that, "the opposition to the plan precluded a presentation of the 4-5 lane project by the consultants, Kimberely-Horn Associates, hired by GaDOT." Nothing could be further from the truth! Most of the Bass Road meeting was videotaped by a stakeholder. (This tape is available to any elected official or citizen that would like to view it) The videotape shows that everyone had a chance to speak. Almost everyone did speak or nod at other citizen's disapproval of the M-A plan. The opinion of stakeholders was this: "M-A needs to create a better, leaner, smaller option before they call another stakeholders meeting." 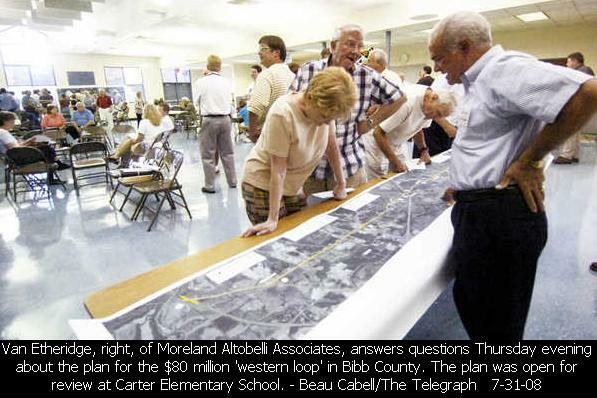 They all rejected the 5-lane Zebulon Road type model that was presented to them. In fact, at one point a stakeholder asked the group, "If there is anyone in this room that is for this plan, other than the bureaucrats, please raise your hand." No one did! Mr Duval needs to withdraw the misstatements he made before the court reporter at the TAC meeting. And M-A Associates needs more judicious oversight from Bibb County citizens. Why? Because continued misinformation and mismanagement by the Road Program befuddles and confuses those sincere elected officials who truly care how many wasted tax dollars are burdened on the taxpayers by these kind of actions. Thanks for the quick answer! I look forward to the in-depth answer in your upcoming article. Communities all across the U.S. are concerned about the safety of their residential streets. Although this concern is nearly universal, the literature offers few precedents and little information on the relative safety of common residential street typologies. This study offers a method for analyzing the theory that the physical design of streets impacts safety. Through research, systematic observation, and statistical analysis, an attempt was made to identify the safest residential street form with respect to several physical characteristics. These findings expose issues that need to be addressed by practitioners and policy-makers and encourage further study of related topics. Approximately 20,000 police accident reports from the City of Longmont, Colorado, were reviewed and compared against five criteria for evaluating the probability that street design contributed to the accidents. Once catalogued and entered into a database, each accident location was mapped and described by several physical characteristics. To compare injury accidents per mile per year against other factors, several correlations were explored. The most significant relationship to injury accidents was found to be street width. AS street widths widen, accidents per mile per year increases exponentially, and the safest residential street width are the narrowest (curb face). A fundamental element in the field of planning and urban design is the assumption that narrow streets in a grid pattern are safer than wider streets. Although this theory has been discussed at length by practitioners and academics, little substantive research is available to support this assumption. With the cooperation of the City of Longmont, Colorado, this study was designed to complement the literature by evaluating residential street typology and related injury-accident frequency. Clear relationships are evident between accident frequency and street width. The findings support the premise that narrower, so called "skinny" streets are safer than standard width residential streets. Lastly, additional research is encouraged to verify these results. In a very limited search of the literature, three studies were noted. In the first report, the mean free speed of cars in suburban roads increases linearly with the roadway width, particularly between 17 and 37 feet. The second paper by Giese, et al, suggests that spacial enclosure, sight distance and [width] constriction techniques influence vehicle speeds. More fully, vehicle speeds decrease with width constriction. The third study indicates that building enclosure reduces vehicular speeds. This supports the conclusion of this study that narrower streets are safer. 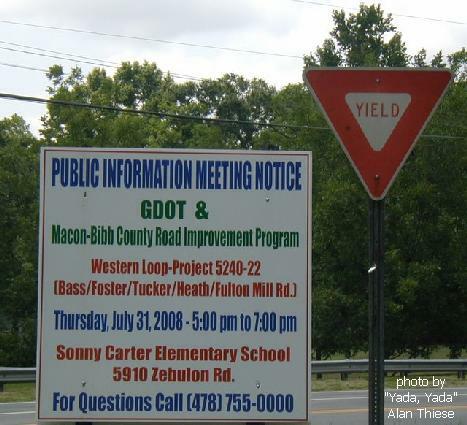 About 150 residents from the Zebulon and Bass road areas met with road officials Thursday night to comment about the proposed "Western Loop" --- the project that would widen Bass, Foster, Tucker, Heath and Fulton Mill roads from Interstate 75 to Columbus Road. Many of the residents had questions. Many had criticisms. But most just wanted to keep informed about how the project will affect their houses and their neighborhoods. Comments varied, ranging from people who were irritated with some road officials who "ignore" residents' pleas to people who were concerned about the removal and replacement of power, water and sewer lines. Jim Pohlman, a consultant for the project, reminded the residents that the project is in its infancy. No solid plans exist. Right now, Pohlman said, funding is in place to start the design portion of the project. Funding to purchase the land won't become available until 2006. The construction phase isn't expected to begin until 2007 or 2008. J.C. Johnson, who lives on Bass Road between Zebulon and Forsyth roads, said he is concerned that he has a tremendous amount of traffic in front of his house already. If the new project includes a median dividing Bass Road, he thinks the already quick motorists will have an excuse to go even faster. "I think it's a speedway enough," Johnson said. R.S. Shoemaker, who lives on Ashley Hall Road near Foster Road, said the preliminary plans he saw call for turn lanes only large enough to accommodate three cars. "The improvements are totally inadequate," he said. Willie Jones, who lives in the Heathwood subdivision off Heath Road, said with the existing traffic it already takes her five or six minutes just to pull out of her neighborhood. Wider roads, she said, might make that even more difficult. Jones, like several residents in attendance, said she was expecting to hear a presentation about the project. Instead, the residents were all asked for their comments. "I can't put in any input when I don't know any output on the project," she said followed by a round of applause. Pohlman reiterated that the purpose of the meeting was to get information. Project designers are, likewise, uninformed right now. "To tell you the truth," he said, "we don't know either right now." Residents filled out information cards so designers can select a neighborhood committee to aid with the project's progress.